When it comes to virtual reality there are a few options: go down the fully-formed route, with PC powering everything, like HTC Vive; opt for a headset that requires a phone to be slipped in to act as the processor and screen, such as the Google Daydream View; or opt for a wire-free fully standalone headset. For convenience it's the last of those that's the most sensible for casual users, which is exactly where the Lenovo Mirage Solo with Daydream fits in. While the Solo fits into the Google Daydream OS platform, offering a similar user experience to the Daydream View, the whole process of using the Lenovo product is far simpler. There's no phone to slip in, its larger headset and panels makes for greater comfort in use, while it also offers six degrees of freedom for greater in-game control. So is Lenovo onto a standalone VR winner? Compared to Google Daydream, the Lenovo Mirage Solo is far more comfortable to wear. 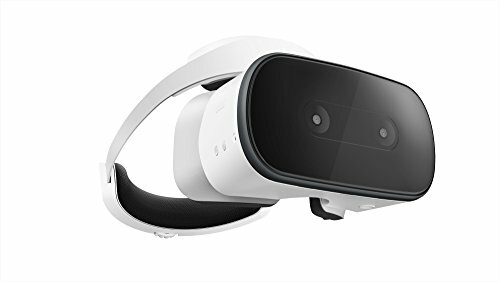 It's larger, but better padded and has an easy-to-adjust rear wheel to help it fit in place - similar to the Dell Visor Windows Mixed Reality headset. Once slipped over the head there's minimal rear reflection on the 5.5-inch screen, although some light leakage stops it from being as perfect as a high-end headset like, say, HTC Vive. It's still well contained, though. We found the headset comfortable to wear for short periods, with the adjustable wheel to the back ultra easy to use. However, as there's no over-the-head padding it can slip down and add pressure to the nose, so longer sessions might be less comfortable - just as we'd say of the Lenovo Explorer Windows Mixed Reality headset. A principal feature of the Mirage Solo is that if offers not three, but six degrees of freedom. This allows for greater control to lean, dodge, jump and so forth through three-dimensional VR worlds. Just like Google Daydream View, the included controller is a basic "TV remote" in style. It's got a trackpad and two additional buttons, which keeps things simple for single-handed use (especially when "blind" to seeing the controller itself). It's not the most exciting of controllers, nor does it need to be. Setup is super simple, with the integrated front cameras measuring surroundings to associate a 1.5m square play space around you. The cameras aren't used to show the real world, solely for the setup process, so you can't see the outside world during play. Try and extend beyond your play space and the device will warn you, a bit like HTC Vive, with a virtual wall to the face. In terms of quality, the 1440p per eye resolution offers decent clarity, while the top-end Qualcomm processor behind the scenes offers a similar to flagship phone experience. Indeed, as there's no additional apps running in Daydream OS, like there would be on an Android phone, the 4GB integrated RAM ensured smooth operation of various games. We played Blade Runner and everything looked wonderfully clear (even if, as a game, the click-to-move controls are horribly slow). As the Solo is standalone, without the need for a phone, it lasts for a long time too. So there's no fear, like with Daydream, that extracting your then boiling-hot smartphone will see it with a mere 25 per cent battery life remaining to get you through the day. Nope, the Solo will last seven hours of gaming, Lenovo says. An integrated USB-C port acts as the charger, although there's no minute detail on exactly how quickly this will recharge that battery. If you want to carry a battery pack around with you, however, then charging on the go ought to be no issue. To make the Solo more than just an, er, solo experience, it also includes integrated Google Cast. This means you can broadcast direct from the headset to a Cast device, such as a TV, for onlookers, family members and friends to egg you on during your gaming - which makes for a potentially more interactive experience. The Lenovo Mirage Solo is a well made and comfortable-to-wear product, with greater control in use compared to the Google Daydream View. And as the Lenovo requires no phone it's a more accessible way to experience Google's ever-evolving VR project, without the fuss of wires or a PC like HTC Vive. It's not overpriced either, which further adds to the appeal. The Lenovo Mirage Solo with Google Daydream will be available from the second quarter of 2018, with a price tag "under $400". A Lenovo Mirage Camera, capable of capturing 180-degree VR video/stills footage will also be available, with a price tag "under $300".